Ahh, the mountains. 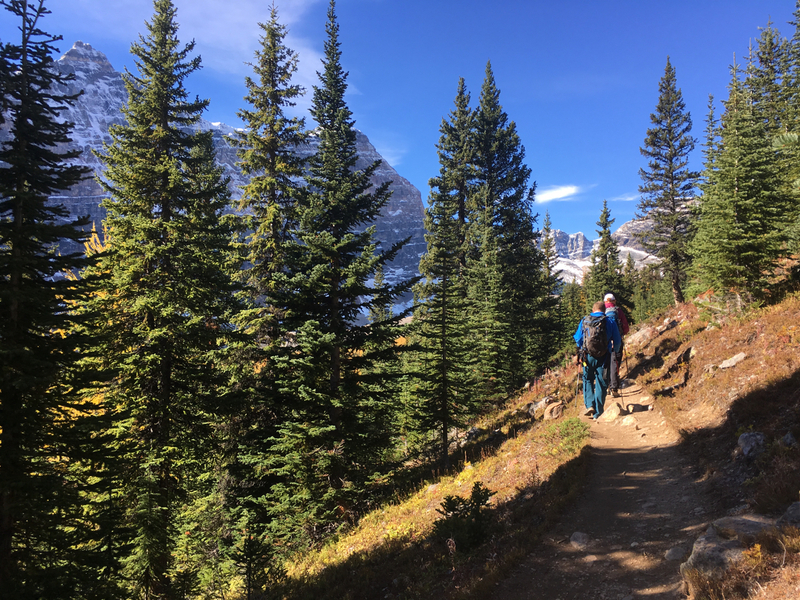 Autumn is one of the best times to go for a hike in the Rockies - for a number of reasons. The snow has had a chance to completely melt from the trails and wooded areas. 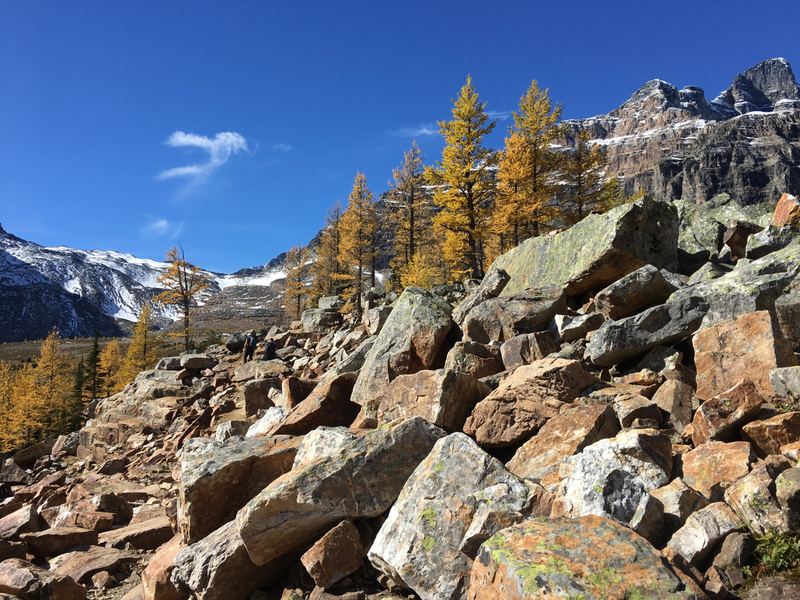 As the heat of summer has already begun to fade, there will likely be a dusting of snow on peaks to emphasize their majesty. The leaves (and needles, in some cases) have begun to transition from green to yellow, orange or red and are, arguably, at the height of their beauty. Water in the streams and rivers is down to a trickle, making it very easy to cross them. The likelihood of rain is much lower. The tourists have come, taken their selfies, been herded back onto their tour buses and returned to their respective homelands, leaving the trails much less crowded. Being here is good for our souls. 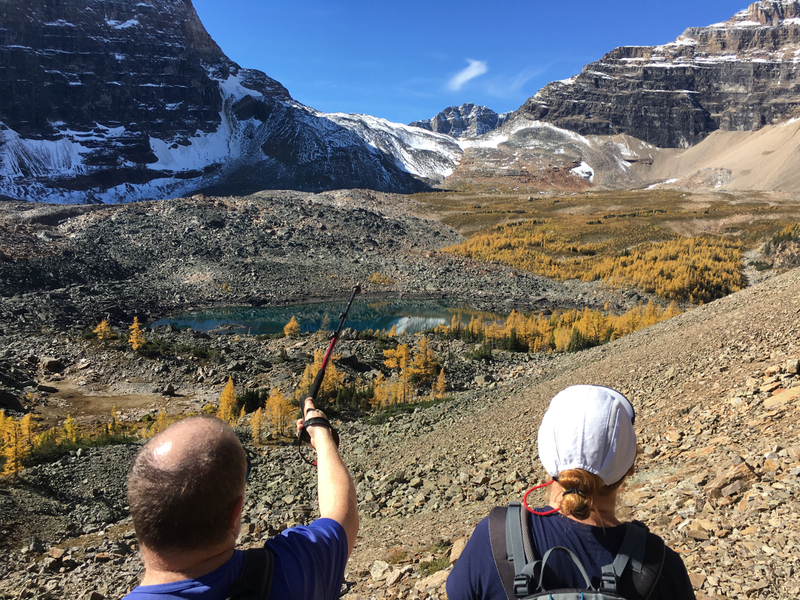 This will be our last Canadian hike of the year ... and we couldn't have picked a better day for it. Departing from Calgary at a sensible 9 am, we met Gord Gilbertson and drove the two hours to the trailhead at Moraine Lake, near Lake Louise. Although the parking lot was quite busy, we did find a spot. 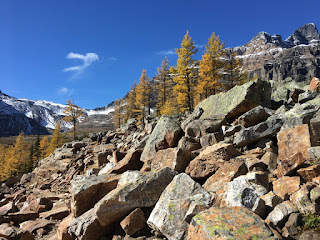 Not all of the tourists have left, as the well-informed traveller knows that Larch Season is in its glory right now. There were many on the trail for the first 500 m. There are a number of trails that branch off this main trail. 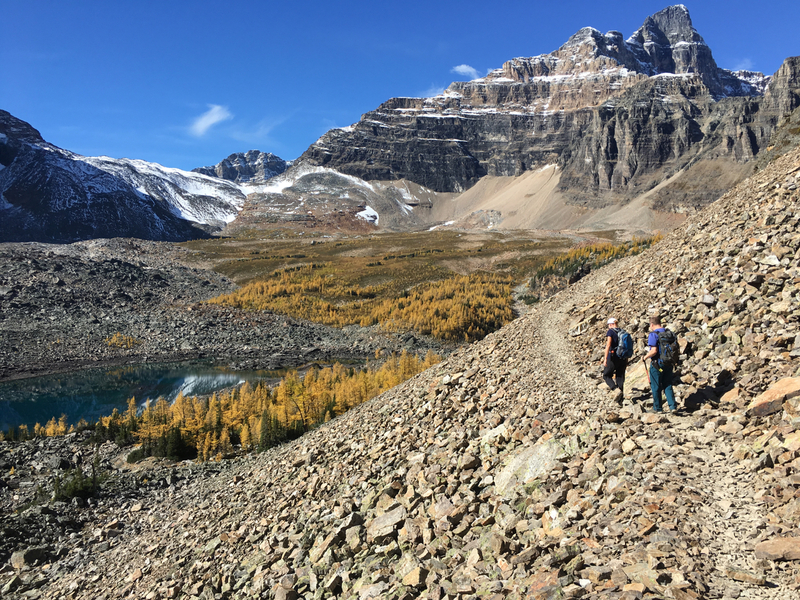 It seemed the majority were heading for Larch Valley so when our chance came to veer towards Eiffel Lake, the traffic eased considerably. 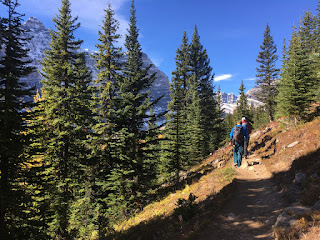 The steep grade of the first few kilometres acted as a further detriment to any undecided hikers, but we knew the reward that awaited us and soldiered on, puffing up the narrower pathway. After 30 minutes of up, things began to flatten out as we wiggled along the steep valley. 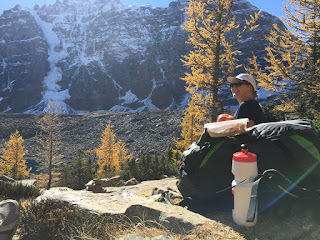 We had the occasional glimpse down through the pines to the turquiose water of Moraine Lake when we passed by thinner bits of forest - a reward for all the climbing we had done. 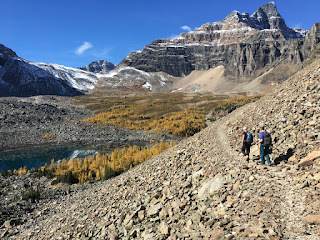 As we gradually climbed and broke through the treeline, we emerged onto the scree slopes in the Valley of the Ten Peaks. 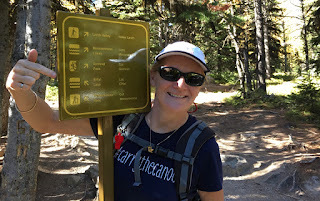 The trails are surprisingly visible and in good shape, considering how remote it felt as we made our way along them. Two hours after starting our hike, we found some big, flat rocks in the sun and sat down to eat our sandwiches. Being here gives me a great feeling of peace and gratitude. Being out with Gord today, I suddenly noted that I have been doing outdoorsy things with him for over 35 years. He was part of the group I was with (our high school's Outdoor Recreation Club) when I first fell in love with the Rockies. Over 35 years and I'm still not jaded by this place. This part of Alberta and BC will always draw me back. During my courting of these big hunks of limestone and granite, I've hiked, skied, climbed, swam, canoed, kayaked, cycled and slept amoungst these peaks whenever I could. Having a willing playmate in Kate has meant that in the past ten years, I've been able to explore more broadly throughout the world. 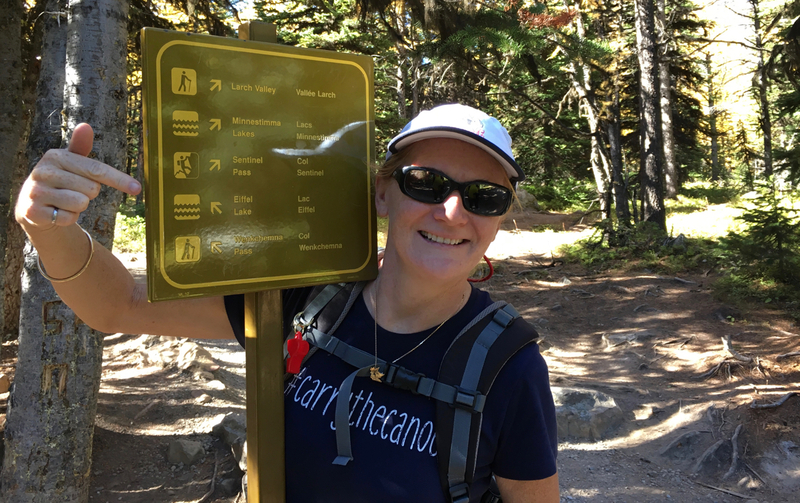 Wildly new places and activities are options I hadn't even considered ... bushwalking in southern Australia; birdwatching in South Africa; sailing across Indonesia; cycling across Switzerland. Even though I travel extensively, I know that the Rockies will be where I want to come back to so I can recharge my spirit. As I sat and enjoyed the surroundings, my sandwich, the fresh air and the company I was with, I realized that I needed to be here ... every once in a while. Now, which boulder looks most comfortable?